Public lands are a uniquely American idea and every American has an ownership stake in the lands we all own. For decades, we’ve done our best to manage these lands for local communities and a growing nation, even while preserving their unique natural, historic, or cultural features. The result has been national monuments and parks, national forests and wildlife refuges, wild and scenic rivers, wilderness areas and a host of other specially designated places preserved as a gift to future Americans. These iconic places define the American West. But the Trump administration brings a new philosophy to public land management. Their changes appear to be part of a larger strategy articulated by President Donald Trump’s senior strategist, Steve Bannon, to advance in his words “the deconstruction of the administrative state.” During his first 100 days, Trump has aggressively implemented this strategy by reviewing and repealing Obama-era conservation initiatives and long-standing policies; replacing agency personnel; and setting the stage to shrink federal land management agencies and make their important work even harder. The Federal Land Policy and Management Act and the National Forest Management Act, both enacted in 1976, were supposed to end decades of public land disposal and resource plunder, and to affirm that the public lands would be managed for the greater good of all uses for the long term. Multiple use and sustained yield were the concepts that would guide how public lands and national forests would be managed from then on. But couple the Trump “deconstruction” philosophy with a growing pack of lawmakers who want to hand federal land over to state and local interests and the stage is set to re-litigate the laws and policies that have guided public land for half a century. How can they do this? Through the people the president puts in charge, the policies they implement, and the budget they dispense. 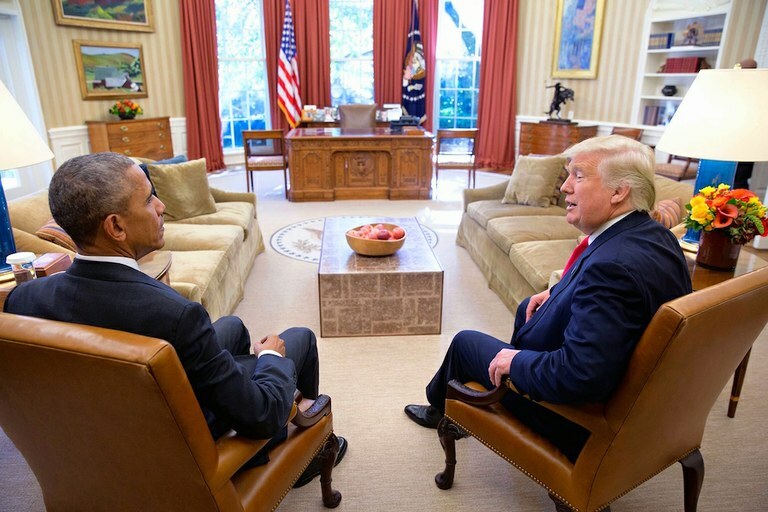 Two days after the election, then-President Barack Obama meets with President-elect Donald Trump.” Between them, the tabernacle of presidential power, the legendary Resolute desk, divides the room. Two key political appointments likely to significantly influence future public land policies are Interior Secretary Ryan Zinke and Supreme Court Justice Neil Gorsuch, who are both Westerners. Zinke, an avid outdoorsman, opposed a GOP position advocating the transfer of public lands, while supporting full funding for the Land and Water Conservation Fund. His first day in office, Zinke directed his agencies to expand public access for hunting, fishing and outdoor recreation — a tip of his cowboy hat to the sportsmen’s groups that supported him. But soon after that he announced that “the Interior Department is in the energy business.” As if to illustrate the point, he then named as acting director of the Bureau of Land Management Mike Nedd, the agency’s lead for energy and minerals, replacing Kristin Bail, who had previously managed the renewable resources program. Zinke then reopened public lands to coal mining, set aside a policy requiring developers to mitigate any damage to public lands they might cause, and put on hold his department’s climate change efforts. Finally, Zinke directed his agencies to do a rapid review of any rules or policies impeding domestic energy production as a precursor to new policy direction likely to accelerate energy development on public lands. He is currently in Utah, assessing both Bears Ears and Grand Staircase-Escalante, two monuments that rankle local control advocates. Perhaps Trump’s most significant public lands decision so far, though, was Gorsuch’s nomination. Gorsuch’s views on the standing of sportsman and environmental groups to challenge public land management decisions and his stance on the so-called Chevron deference – which reinforces the authority of federal officials to interpret and implement the law – could hasten the deconstruction of public lands, particularly if the Supreme Court reverses Chevron. Should the White House decide to modify or eliminate any monuments, the administration’s legal authority to do so is certain to be tested in the courts. And, should this issue get to the Supreme Court with Gorsuch on the bench, the outcome is increasingly in question. Of course, an effort to eliminate the Antiquities Act, used by Republican and Democratic presidents since Teddy Roosevelt, could also come up in the Congress. In addition, the Trump White House has worked with the Republican Congress to make unprecedented use of the Congressional Review Act, or CRA, to rescind rules affecting public land use and management not to the administration’s liking. CRA provides 60 legislative days for Congress to decide which rules from the previous administration should be terminated. Using the CRA, Congress has axed rules affecting stream protection, what companies pay for energy from public lands, and a BLM planning rule intended to make the process more inclusive and transparent. According to the CRA, once rescinded, the government can never issue a rule that is “substantially similar” to the rule that was killed. A desire to return public land management decisions to local control is a thread that connects many of the administration’s new public land policies. Despite the public process that brought about BLM Planning 2.0, an update to its decades old planning process—opponents objected. In particular, they rejected the concept of “landscape-scale” planning, which was adopted to improve BLM’s ability to deal with issues like fire, water management, invasive species, and wildlife habitat which often transcend county and state political boundaries. Rule opponents asserted that landscape planning would empower others outside of their communities (i.e., environmentalists) to have more influence over how nearby public lands are managed. Also under review is the September 2015 determination by the U.S. Fish and Wildlife Service that Endangered Species Act protection for the Greater sage grouse would not be necessary. The Service’s decision was based on federal and state grouse management plans – the product of years of major collaboration among federal and state agencies, governors, private landowners, and others. Despite this historic conservation effort to protect an ecosystem and avert the need to use the ESA to prevent the grouse’s demise, House Natural Resources Committee Chairman Rob Bishop, R-Utah, is likely to repeat his efforts to insist that sage grouse management be dictated by individual state sage grouse plans and not the collaborative ecosystem conservation strategy. And if, as a result, the Fish and Wildlife Service should find the individual state sage grouse plans inadequate, Bishop is likely to also include language to prevent the agency from listing the grouse — thereby threatening the integrity of bedrock conservation law. In addition to all this, the Trump administration is clearly intent on shrinking the size of the federal government. An initial hiring freeze followed by proposed historic cuts in the administration’s budgets for the EPA, USDA, and DOI reinforced the message that the role and authority of federal conservation agencies will be substantially reduced. Trump also issued an executive order essentially requiring federal agencies to justify their existence, as a precursor to the president’s plan to reorganize the government through his Office of Management and Budget. This could become part of the battle over next year’s federal budget. Regardless of whether efforts to sell or transfer public lands ultimately succeed, the combination of policy rescissions and reviews, new direction to prioritize energy and mineral development, and potential elimination or modification of national monuments, signals a dramatic shift in federal policy. The Trump approach is in fact more akin to how the public lands were managed before the multiple use and sustained yield dictates of the Federal Land Policy and National Forest management acts. Add to this the potential for steep cuts in agency budgets, and management agencies may be hard pressed to fulfill their responsibilities. Decisions by the Trump administration to reverse, rescind, and revisit Obama’s conservation policies and land protection initiatives have been comprehensive and relentless. The barrage of executive orders, directives and policy reviews looks like a “shock and awe” campaign against conservation, clearly designed to disrupt years of progress. Should this deconstruction succeed, management of the public lands may revert to the states and, by default, to the leasees and permittees who drill, mine, cut, graze and otherwise use for their own profit. How will others who depend on the public lands fare? Can sportsmen be confident that fish and wildlife habitat will be conserved, or that access will remain open? Will rural communities benefit from more aggressive energy and mineral development, or will this focus be at the expense of the booming outdoor recreation economy? And how will the Trump administration policies affect remaining wildlands, open space, and the iconic natural, cultural, and historic resources that symbolize the American West? Under Trump, the future of our public lands could be at stake. Jim Lyons is a lecturer and research scholar at the Yale School of Forestry. He was the deputy assistant secretary for lands and minerals under the Obama administration’s Interior Department and the USDA’s undersecretary for natural resources and the environment during the Clinton administration.